These GAPS chicken nuggets are perfect for the picky eaters. This recipe is simple, yet delicious. I have heard that a lot of picky eaters love Chicken McNuggets. If this is the case in your house hold, here is a much healthier replacement. You can bake it or fry it. Either way, they are very moist and perfect for the delicate bellies out there. When my kids could not tolerate eggs I found it really hard to find chicken nugget recipes that didn't call for eggs. So I made sure to make this recipe egg-free. This recipe can be baked or fried. I find that if I want to make a big batch for freezing, baking makes more sense. I also buy organic boneless and skinless chicken thighs and grind them myself but buying ground chicken will also work. We use bacon fat for frying but you could also use coconut oil, lard or ghee. Either way, they are delicious! If you have concerns about bacon or saturated fats, check out my post for the healthy benefits of saturated fats. In a large bowl add white pepper, nutmeg, garlic salt, onion powder, ground mustard and kosher salt. Add ground chicken and knead with your hands until well combined. Get a cookie sheet lined with parchment paper ready. Make ping-pong size meat balls in your hand, place them in the cookie sheet and press them flat into nugget form. Once all nuggets are formed, cover them with plastic wrap and place it in the refrigerator for 30 minutes. In the mean time get the breading ingredients set up. Mix coconut flour, white pepper and kosher salt in a shallow bowl. Dip each nugget in this mixture, then shake off the excess lightly. 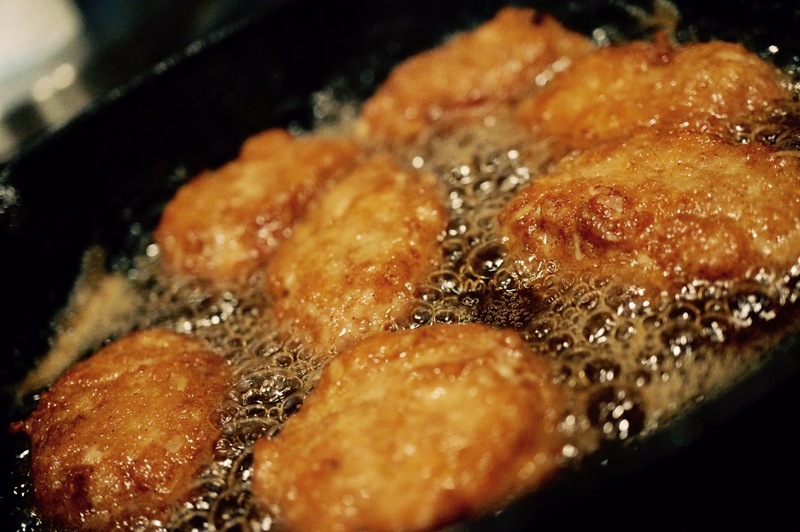 Fry nuggets in a skillet in low heat for 3-4 minutes on each side or until golden. In a separate shallow bowl, drizzle some olive oil and save the remaining to be drizzled into the bowl as you go. In a third shallow bowl add the shredded coconut. Dip each nugget into the coconut flour mixture, then shake off the excess lightly. Then dip the nugget into olive oil and shake off excess. Finally dip it into the shredded coconut. Use your fingers or a spoon and lightly press it onto the nuggets. Place nuggets in a cookie sheet and bake for 20 minutes on each side for a total of 40 minutes or until lightly golden. Tip: you can use tongs to handle your nuggets and keep your hands chicken free!